Now everyone can put their obscure and pointless knowledge to the test with this board game version of the popular BBC1 Quiz show hosted by Alexander Armstrong. Players plumb the depths of their general knowledge to find the least popular, correct answers to questions as they fight against their natural instincts…. Now everyone can put their obscure and pointless knowledge to the test with this board game version of the popular BBC1 quiz show, Pointless. Players plumb the depths of their general knowledge to find the least popular, correct answers to questions; fighting against their natural instincts. Board game information: 2-4 players. General information: For ages 10 years and over; EAN/MPN/UPC/ISBN: 5018163005294. WARNING(S): Not suitable for children under 3 years old. Can you name a country beginning with the letter M that no one else would think of? How about Mali or Micronesia? Can you think of a character from Toy Story that nobody else would remember? We all know Buzz Lightyear, but who remembers Wheezy the penguin? Put your obscure and pointless knowledge to the test with this board game version of the popular BBC2 quiz show hosted by Alexander Armstrong.Fight against your natural instincts as you try to score the least number of points by guessing the least popular answers to general knowledge questions. Any correct answers the survey didn’t think of are Pointless answers and award a most desirable zero points. Who will carry off the Pointless trophy among your family and friends?For 2 to 4 players or teams. This toy costs approximately £19.99 (for the latest and best prices make sure you check our retailer list for the Pointless Board Game above). 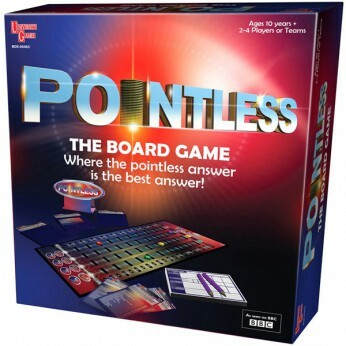 In our review of Pointless Board Game we classed it as being suitable for ages 9 years, over 10 years, Teenagers but recommend you check the manufacturer specific advice before purchasing.